Do you love Banh Mi like we love Banh Mi? Jenny lives above a delicious vietnamese restaurant and is constantly tempted by the unique and delicious aromas that escape from the restaurant. Rather than eat there for both lunch and dinner, which would be very easy to do, we decided to make our own Banh Mi! 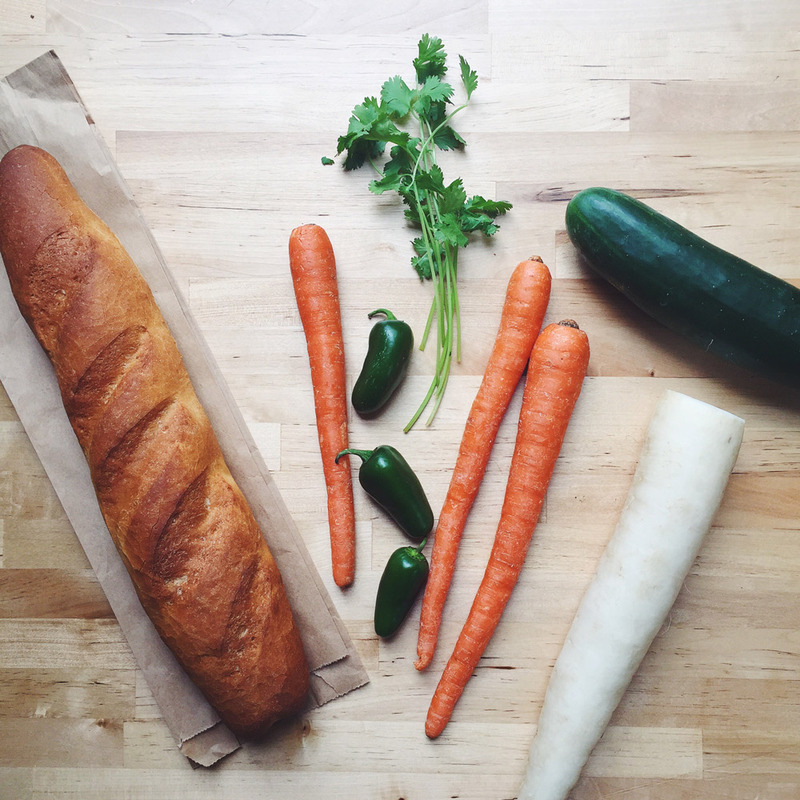 We went downstairs to the market and got a beautiful, freshly baked baguette and some crisp summer vegetables to add to the home grown jalapenos we were gifted yesterday. Honestly, we were a bit skeptic when we started this recipe. How could our first ever Banh Mi trial be as tasty as the Banh Mi of seasoned chefs? We were pleasantly surprised when we took our first bite! It tasted just like the Banh Mi we order at our favorite restaurants. The pickled veggies are the winning ingredient (although it was a tough decision). The recipe we wrote makes more than needed for these sandwiches; you’re welcome! They will become a staple in our fridge and will be sprinkled on salads, pasta salads, tacos and so much more! In a small bowl mix the mayonnaise and sriracha. Slice the baguettes in half and spread with the sriracha mayo mixture. Add two pieces of Lemongrass tofu, some pickled veggies, cucumber, cilantro and jalapenos. Serve immediately and enjoy! This is perfect served alongside our spring rolls or with your favorite bowl of asian inspired soup. Combine the rice vinegar, water and sugar in a pot over medium heat. Stir continuously until the sugar is dissolved. Remove from heat and allow to cool at least to room temperature. 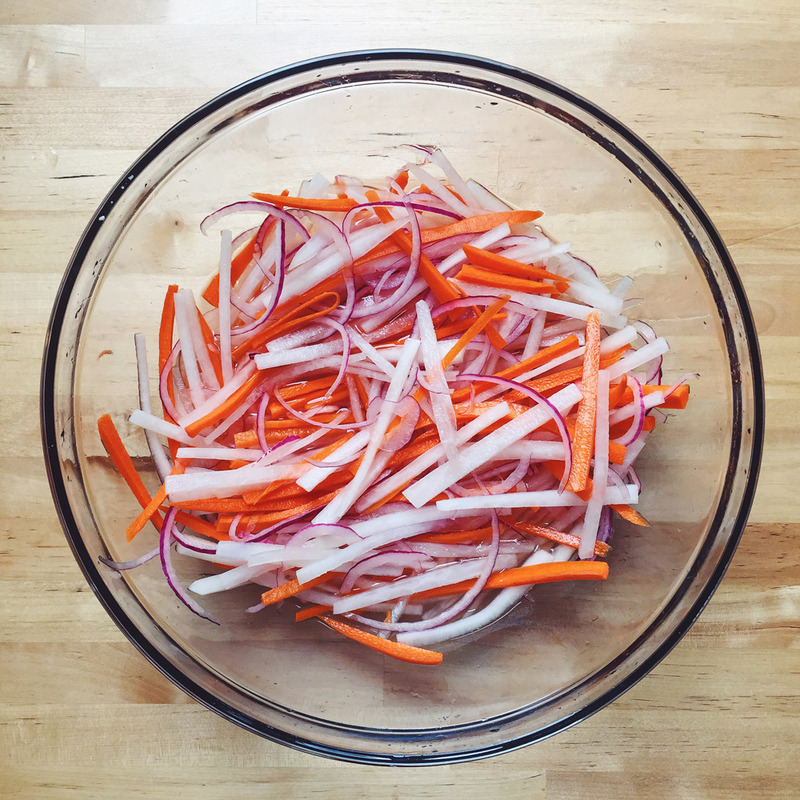 In a large bowl mix the vinegar mixture with the radish, carrots and onion. Toss to coat evenly then cover and allow to marinade in the fridge for a minimum of 30 minutes. Drain and use as needed. Store any leftovers in a mason jar with the pickling liquid for up to a week in the fridge. Slice the tofu into 4, ½ inch slices and press the excess water out of the tofu by placing the slices between two towels and covering with a flat, heavy object. Let the tofu press for about 20 minutes. Mix the remaining ingredient s in a plastic container and marinate the pressed tofu for 30 minutes. Lay the tofu on a greased baking sheet and dab with any remaining marinade. Bake the tofu for 15-20 minutes, flipping halfway through.